2. Directions: These questions consist of two statements each printed as assertion and reason. While answering these questions you are required to choose any one of the following responses. 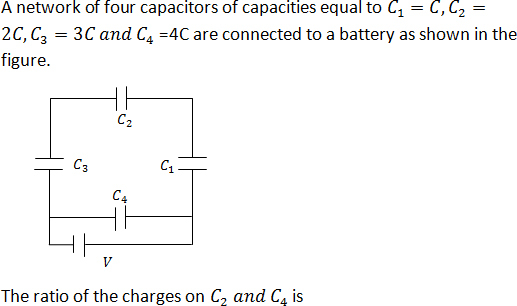 Hide DirectionsAssertion: A condenser of capacitance C and charge Q is connected to a battery of potential V. The battery connection is then removed and the dilelectric slab is introduced between the plates and E is the energy of condenser than capacitance increases. 3. Directions: These question consists of two statements each, printed as assertion and reason. While answering these questions you are required to choose any one of the following five responses. (A)If both assertion and reason are true and reason is correct explanation of Assertion. (D)If both the assertion and reason are false. 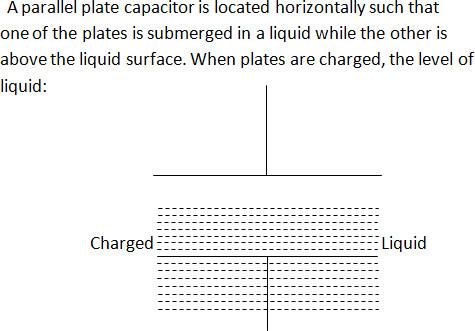 Hide DirectionsAssertion: If the distance between parallel plates of a capacitor is halved and dielectric constant is three times, then the capacitance becomes 6 times. Hide Directions:Assertion: A parallel plate capacitor is connected across battery through a key. A dielectric slab of dielectric constant K is introduced between the plates. The energy which is stored becomes K times. Reason: The surface density of change on the plate remains constant or unchanged. Hide DirectionsAssertion: Circuit containing capacitors should be handled cautiously even when there is no current. Reason: The capacitors are very delicate and so quickly break down.